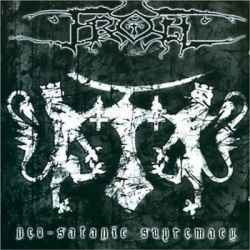 Troll from Norway must be counted among the pioneers of the symphonic black metal scene. Founded already in 1992 by a bunch of fourteen year old teenagers, they released three albums between 1996 and 2001, receiving mostly favourable reviews from the international press. A longer break had many fans suspect that the band broke up, but after a nine year hiatus they are back with Neo-Satanic Supremacy that easily continues the quality of their earlier works. Unlike in the past, Troll is no longer a solo project fronted by Nagash (The Kovenant, ex- Dimmu Borgir) but a regular band that has abandoned the formerly electronic gadgetry, instead concentrating once more on the origins of black metal. Their songs are mostly concise and never lose any time getting to the point. Troll don’t lose themselves in artificially complex structures but play dynamically straight ahead and channel their energies on the strictly necessary. The overall pace is rather brisk, but the album nevertheless contains a sufficient number of moods that have been placed tactically. The smartly used keyboards furthermore enhance this. The album starts with The Helvete Med Alt, a furious opener that instantly sets you in the right mood for what is to follow. On Alt For Satan, Troll display their dramatic side, and on Gå Til Krig we are even surprised with a fitting string section. Burn The Witch is another fast track with rich instrumentation. The album peaks in its middle part with the two longer dramatic pieces Mörkets Skoger and Hvor Tåken Ligger Så Trist Og Grå, both displaying perfectly the band’s versatility. The album ends with four shorter and rawer tracks where especially the breakneck speed of the title track and the concluding rough Age Of Satan totally convince. This comeback album by Troll is an unquestionable success. Neo-Satanic Supremany is a strong black metal release that has found the ideal balance between the unpolished and melodic extremes of the genre and consequently should appeal to black metal fans of all convictions. Troll have started the race for the best black metal album of this year already very early.